Sometimes I like to look at the discounted cards in the card aisle at Target. There are usually a few boxes there that are sold at a significant discount. 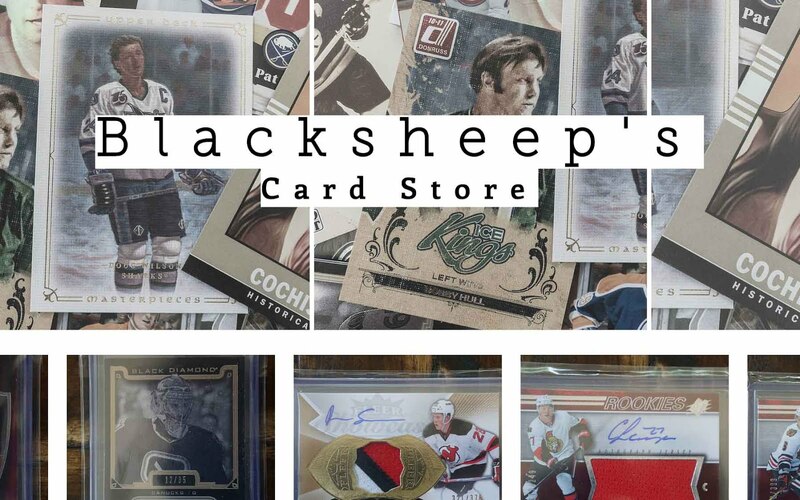 There usually isn't any hockey cards... which is too bad. But they did have this box of 2012 Leaf Draft Pick football for just $12.99. The box states that there is one autographed card guaranteed per box. Well... I like autographs, so I went ahead and gave it a try. I don't have any real high hopes with this box of Leaf Draft, but last year's football rookie class with RGIII was pretty good, so I said 'why not'! The cover boy on this box was RGIII himself, so maybe there would be a chance to pull him? I'm pretty sure it would be next to impossible, but with a price of only $12.99, I thought it would be worth it. Besides the box of Leaf I also grabbed to packs of 13/14 Upper Deck Series One. 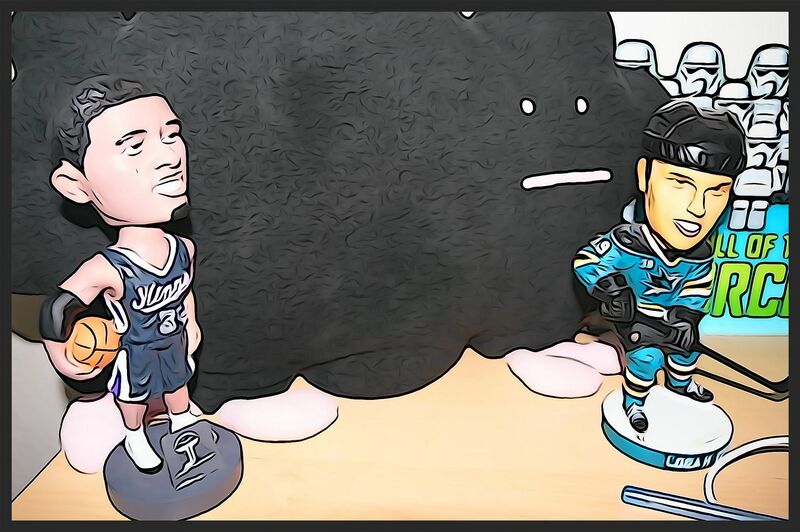 I wanted to have some hockey in this Retail Review! My hockey pack choices were very limited at my Target. It was either UD1 or Artifacts. I'm pretty sure choosing UD1 was the right choice. Buying loose retail packs out of a retail box of Artifacts does not ever seem like a winning proposition to me. The Leaf box wasn't really a surprise. The contents of the box were listed right on the front. There were no packs to be had in the box, just a cellophane wrapped brick of cards. I got one complete set of 2012 Leaf Draft cards as well as 10 gold parallels and the guaranteed autograph. 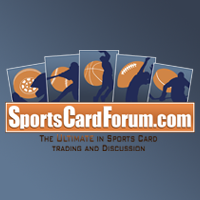 The cards are unlicensed so there are no logos featured on the players. Yep, no college or pro logos at all! That really cheapens the look of the card, but at least the cards are clean and look decently designed. They really remind me of the cards of yesteryear. I think Leaf did the best they could with this product. The ten gold card parallels weren't anything spectacular, but I did get a Doug Martin card out of it. He was probably my best parallel card. The Upper Deck packs didn't have too much in them. I wished I was able to pull a Young Gun out, but I couldn't beat the odds this time around. 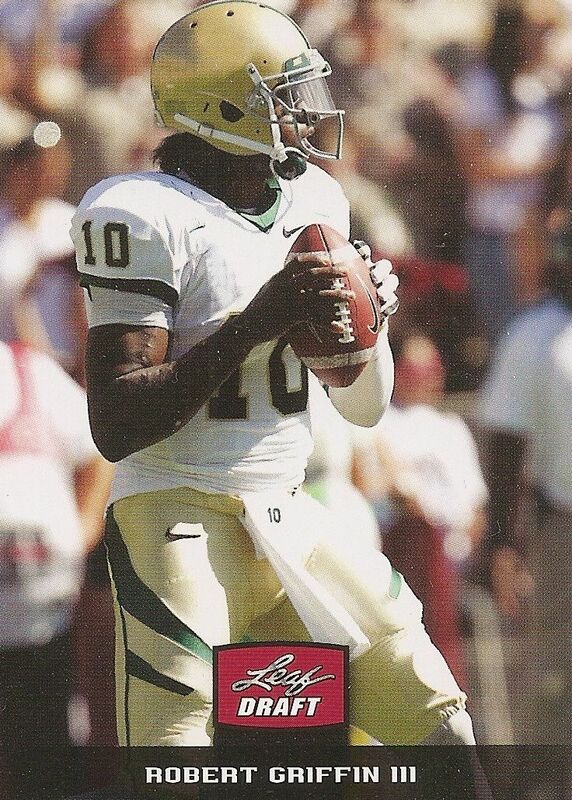 This was the second card of a special three card set of Robert Griffin III cards. I chose this one because I think this one looks the best out of the three. If I had gotten this box as a younger collector, I think I would have treasured these three cards as a cool special edition card that only came in these boxes. Things like that really mattered back in the day. 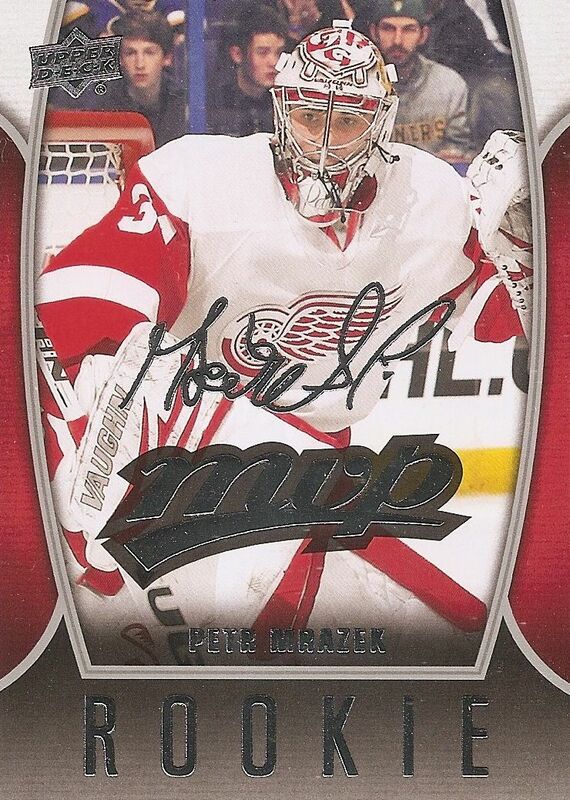 This Mrazek MVP rookie card inset was the only non-base card I pulled out of my Upper Deck packs. But I'm glad I got something at least! I think I would have been pretty sad if both my UD1 packs were all base. I would say that getting a rookie MVP card is definitely better than a standard MVP base insert too. These rookie cards look much better than the regular MVP base. Of course the card with the ink gets the number one spot. I checked the prices of Tim Benford on eBay. Well, the results were not promising. But this was definitely the best card of the break as it was my only hit. 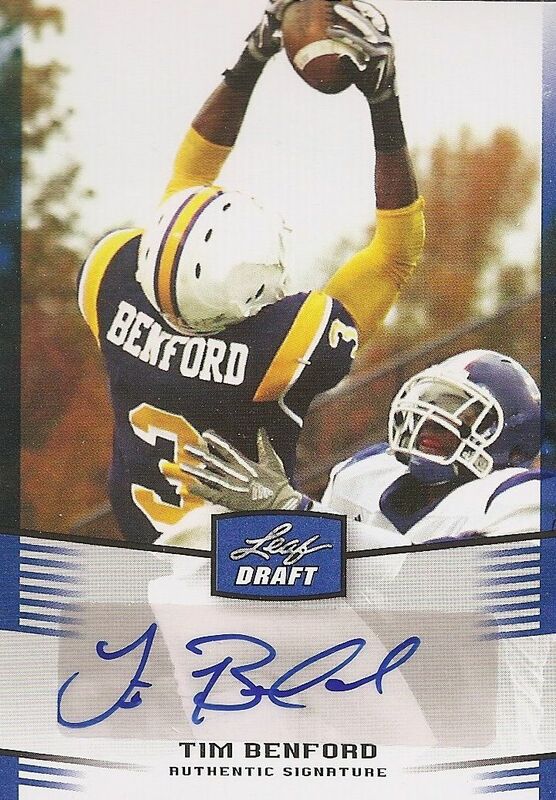 And who knows, maybe one day Benford will break out in the NFL! For just $12.99, I thought the Leaf box was a decent buy. I am always pleased to get an autographed card out of retail products. 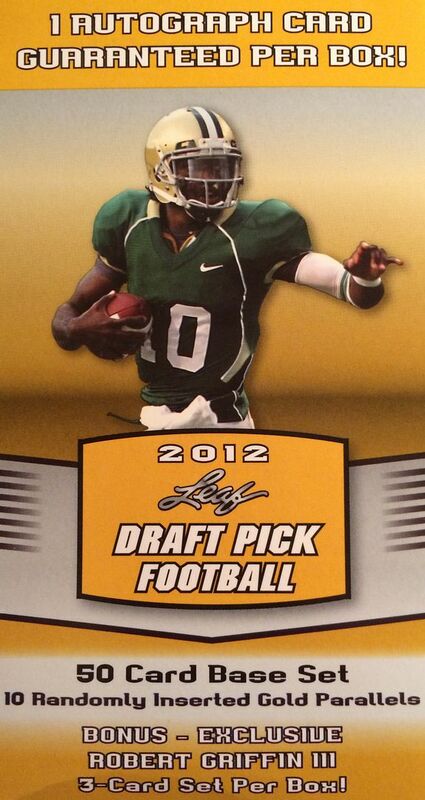 The rest of the cards were nice, clean looking cards that highlighted last year's football draft class. I would say that my overall experience with this product was good. It is a product that I would find difficult to buy over and over again though, as you would end up with quite a few of the same set in your collection. I really wonder if there are big name autographs you can pull out of this Leaf football product. Some research might be in order after my review! The Leaf football is pretty cool since it contains a few RG3's and one auto plus some other decent players such as Alshon Jeffery and others.